I took this picture the morning of the first day of student attendance. My classroom was set up, my plans (for the day at least) were made. All that was missing was the kids. As I stood in my ready-and-waiting classroom, I took a moment to think about the year ahead. This moment - the moment before the first bell rings and kids fill the hallways- is full of promise and possibility. My brain and my heart are filled with ideas and hopes and dreams that will hopefully manifest themselves over the next nine months. Though I know the names of the students who will occupy this space with me, I don't know them. I have the distinct privilege of getting to know who they are, what they are passionate about, what they hope and dream for themselves. This moment -the moment before I am off and running without time to do much besides breathe- is the moment I've waited for all summer as I've read and learned and planned so that I can be the best possible teacher I can be. I am a perfectionist; I don't like making mistakes or feeling unprepared. As a result, I can be incredibly hard on myself. But as I've gotten older and gained experience, I've realized that it is in making mistakes and reflecting on them that I grow as a teacher. If I never reflected, never thought about the things that went wrong as well as the things that went right, I would never be inspired to think about new ways of doing things or reach out to colleagues to find out how they approach teaching different concepts and content areas. I would not be the best teacher I can be. This moment - the moment before my 25th year as a teacher- is one I savored. I am so lucky to be able to do what I love every.single.day. This job is hard. It is draining. It requires critical thinking and quick decision making. It can consume every bit of energy if you let it. But it is also incredibly fulfilling. I get to see my kids grow every day. I know the lessons they learn in my classroom go beyond their multiplication facts and how to find the main idea of a story. They are learning to communicate, to work with others, to make decisions for themselves, to use their voices. This moment is the first great moment of the new school year. Right now, my third graders are deep into our study of informational text. We've spent time looking closely at different kinds of informational texts, examining text features, poring over photographs and infographics, and discussing how authors write about the same topics in different ways. This is one of my favorite units of the year, because the quality of informational text written for kids has exploded since I was in elementary school. Back then, it was always called nonfiction, and was in the dusty part of the library. The books almost never had pretty jackets, the text was dense, and the photos were in black and white. At least in my library, which had very few new books (and I don't remember ever seeing a librarian). Last year, I participated for the first time in the Sibert Smackdown, an activity I found on Melissa Stewart's blog, Celebrate Science. In this project, students closely examine a selection of informational texts and consider their merits according to a rubric based on the selection criteria for the Robert F. Sibert Informational Book Award, giving annually by the American Library Association. You can see the criteria here. My students LOVED this. They were able to use the knowledge they had learned about informational text and be experts... much like the people who were actually on the selection committee! They learned the importance of reading the back matter (not to mention what back matter was). They learned that there are many different types of informational text, and that authors have to choose carefully so that their text structure and organization matches their purpose and audience. In Giant Squid, they also learned to be careful of the gatefolds! This year, I've decided to do this project again. I paid close attention to bloggers and reviewers whenever they posted about nonfiction in order to make sure I was reading as many really great books as I could. As you've probably noticed from previous mentions, I'm a big fan of Melissa Stewart's blog, and I also looked to Allyson Beecher at KidLit Frenzy. Whenever they posted books that were new to me, I got them from my public library and started buying the ones I thought were contenders for their Mock Sibert/Sibert Smackdown lists. Having that year of experience doing the project last year informed my decision making for this go-round. I bought WAY more informational books for my classroom library - so much so that I am now completely out of space for new books. But in the end, it paid off. I did not have to buy a single book when the lists came out. I had all of them! I can't wait to see what the kids think about all of these titles. I'll be writing more about this project as we move through it as well as the work my students do as writers of nonfiction as they research and write their own informational texts. Sometimes, when I read the various blogs I subscribe to or scroll through my Facebook and Instagram feeds, I wonder how everybody but me manages to make everything work all of the time. I realize that's not the case, but it is easy to be caught up in the perfection projected by so many on social media. Where are the posts about the days that just don't work? Because I could use one of those right now to let me know that I'm not the only one who is having a hard time keeping it all together. Don't get me wrong... I love my kids and I love my school and colleagues. My struggle right now has nothing to do with them and everything with me. Each day when I sit in my room after the kids have gone and reflect on the day, I am left with the feeling that something's just not right. I can't figure out what that thing is, but I can feel it. Maybe it's the fact that last year at this time, I was running on pure adrenaline. I was learning so much as I went that I barely had time to think about how things were going. Maybe it's also the fact that it's easy to forget what the beginning of the school year is like - I remember how smoothly everything ran in late May but not necessarily all of the hard work it took to get there. Maybe it's the fact that I'm hard on myself. I know what I do MATTERS, that I have a huge responsibility to do the very best every day for the kids in my class. I don't cut myself much slack, and I don't really like to ask for help, even when I know that I should. So here I am, staring week four of the school year in the face, and I'm wondering when I'm going to hit my groove. It'll come... I know. And if it's like past years, there will be a moment when everything just clicks and I'll be on my way. And next year, when I'm thinking about how hard the beginning of the school year is, I can look back and read this and remember that I've been here before. Get off the train, Mindi! Photo via Creative Commons. Attribution here. This feeling of faster...faster...chug...chug... is a familiar one for teachers. 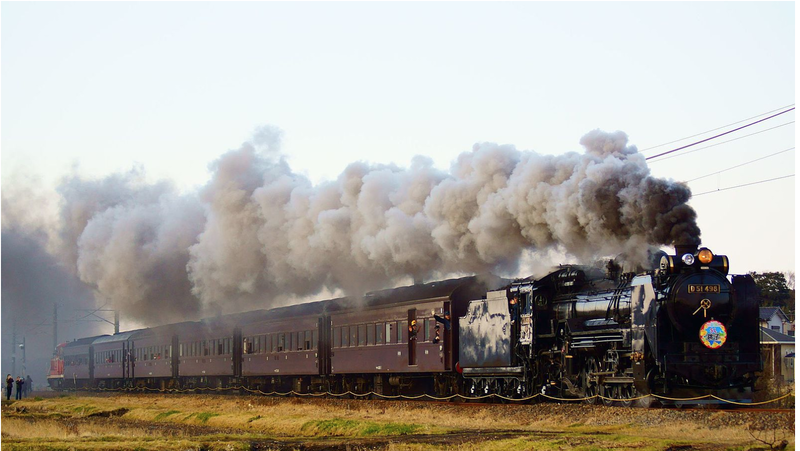 Pacing guides, teacher's editions, and the publishing of test scores underscore this need to move and move quickly. And to be honest, we want to make sure our kids are learning and growing as much as they can in their 180 days in our care. We want to be effective. We want to do our jobs well. But here's the thing. Getting on the curriculum train doesn't help our kids. "Coverage" of content does not guarantee a student is deeply learning. I have to constantly remind myself to slow down, to allow time for my kids to think about what they're reading, writing, and learning, to encourage them to explore the aspects of our curriculum that they are especially interested in, and to allow them time to research their own passions and then share their learning with the class. I've seen for myself the difference in learning when I make myself slow down and let the kids show me what they need and when they're ready to move on. When I ask the class what they're interested in learning about and then let them go, I find that they usually hit the learning targets the district has set out for the unit and much more. They are also learning other skills... how to develop a research question, how to seek out and synthesize information, how to present that information in a way that is interesting and compelling. And more importantly, they are engaged in their learning and excited about it. THIS is what will make a difference in their retention of new knowledge. To be honest, this has been easier for me to do in my literacy block and science and social studies periods than it has been in math. I think this is mostly because I lack the deep understanding of mathematical practices that I have in literacy. I've written about this before, and the work of learning the "why" behind math is work I continue to do. The pacing guide in math also contributes to this as well. It's a much tighter progression through the units than we have in the other subjects. Luckily, I have colleagues who can help me work through how to make the math learning deep and meaningful rather than just surface knowledge that is easily forgotten. So here I am, at the beginning of my third week of school, reminding myself to get off of the train, to listen to my heart and my kids, to take a deep breath and dig in to the work that matters. The transition from the freedom of summer to the routines of the school year can be difficult, even for teachers. During the summer, I can wake up whenever my body decides I've had enough sleep. I can eat when I'm hungry. I can read when I want for as long as I want. I can talk... or not. Students, too, have this transition. They, and I, have to build stamina to do the hard work of learning and growing. The kids have to get used to using their Level 0 or 1 voices during the literacy studio and I have to get used to talking to both the whole class and small groups, and more importantly, giving ample wait time. We all have to get used to eating lunch later than we might like and waiting longer than we might like to go to the bathroom. We often think about building stamina within the definition of the literacy block. At the beginning of the school year, students and teachers work on building stamina in silent reading. Each day the students should be able to read without getting distracted for a longer period of time. We might also talk about writing stamina - the length of time a student can write, which hopefully gets longer each day. I've had to do some serious thinking about my classroom management and stamina this week. The things that worked for me last year don't seem to be working this year. I need to really take a step back and do some kid-watching in order to make decisions about changes we (because it will take BOTH the kids and me to change things) need to make in order to create an environment conducive to learning. 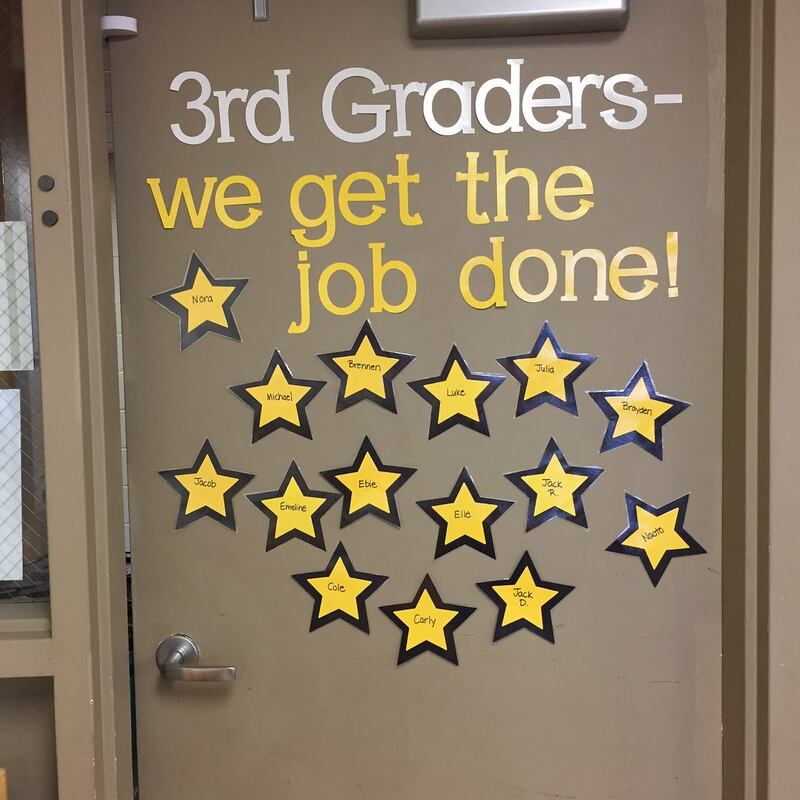 I have to remember that when I think about last year, I am remembering END of the year third graders, but the kids who are sitting in front of me are BEGINNING of the year third graders. Some of them are just now turning eight. I have to remember to cut us all some slack as we adjust to each other and build our learning community. So tonight as I sit here thinking about the year so far, I am kind of ok that I need to make a course correction. If I thought things were PERFECT, I'd be deluding myself. Instead, I need to be realistic but also pragmatic. I need to remember that this school year is a marathon and not a sprint. I felt a sense of satisfaction as I walked through the door. I GOT the job done, and now I get to enjoy my last weekend of summer before I meet my new students on Monday during Meet the Teacher and then on Tuesday when classes start. I won't lie... I spent a LONG time getting my room ready for 2017-2018. 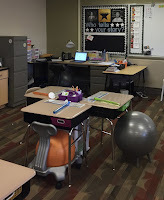 Since early August, I have spent an hour or two (or three) almost every day unpacking Rubbermaid bins, reorganizing and refurbishing my classroom library, arranging furniture, making my classroom decorations, pumping yoga balls, making lists, and making plans. I met with my new classroom assistant (whose kids I had when I taught 7th grade) and met with the preservice teacher who will be joining me for her fall semester clinical. But there comes a time when you have to decide you're finished - or at least finished enough. Teaching is a profession that can easily consume you if you let it. There is always that pressure to do one more thing, read one more book, complete one more form, grade one more paper. I had to learn early in my career that it didn't do me any good to stay at school until 9:00 at night. And once I had kids, I had no choice; I had to leave in time to pick them up from daycare, get them fed, and get them to bed. I had to learn what I could reasonably do in the time I had and just be okay with leaving things unfinished. People talk about work-life balance. I'm not sure such a thing is ever truly possible, at least not for me. When I'm at home, I'm thinking about school, and when I'm at school, I'm thinking about all of the things I need to do at home or all of the places I have to drive my daughters. If I'm caught up at school, then my house is a mess and vice versa. When I see people who seem to have it all together, I wonder how much is real and how much is a great cover, put on because of pressure to be perfect. My house is tidy (mostly) but not perfect. I have help every other week with my heavy cleaning. This was my gift to myself when I returned to work after Abby was born. I do not feel guilty about not being a great housekeeper. I try to do as much of my planning and grading as I can during the school day. This can be difficult, especially on days when meetings are scheduled during my daily plan time. I find that I am more productive in the morning, so I try to get to school as early as I can. My goal for this year is to have plans and copies made before I leave on Friday. I no longer do my daughters' laundry. They are 13 and almost-16. They can use a washer and dryer. I make a plan for meals for the following week and my grocery list on Friday night (I know.. exciting) and then Dan and I do the shopping on Saturday or Sunday morning. Making the plan helps me spend less at the grocery, and we're less tempted to go out to dinner during the week. I'm also more likely to cook healthy meals. Ever since Molly was in Kindergarten, I have taken the Friday before school started and we've done something together. When the kids were little, that meant heading downtown to the American Girl store and having brunch in the restaurant followed by some shopping. Now that they've moved past dolls, we go to a museum or head to Woodfield to finish up our back to school shopping. It doesn't matter what we do; it matters that we're together. This is non-negotiable. So is EVERYTHING finished for my first week of school? Mostly. I have a few things I'll do this weekend, but they're small. Do I feel ready? Mostly. I've never in my career felt completely ready for the first day. Is my classroom done enough? Once upon a time, I thought it was important that I cover every inch of wall space in my classroom with inspirational Argus posters (think kitten dangling from a branch with "Hang In There" written in a cute font across the top). I thought the brighter and bolder the border on my bulletin boards the better. I thought I needed to make up for the fact that the classroom was "on the garden level" of our building and the only way to make it a place my kids would want to be was to make it NEON! These photos are from my 7th grade ELA/US History classroom from about 2003 or so. Notice the premade bulletin boards. Notice the lack of any space for my students to have input in the room. There were some things I did right back in the dark ages. I replaced those god-awful all-in-one desks with tables and chairs. The tables were positioned in such a way that would allow for discussion. My teacher desk (and the desk of the other teacher who taught in my room) were pushed up against the wall and out of the way, leaving more room for kids. It's not the most awful classroom space out there. 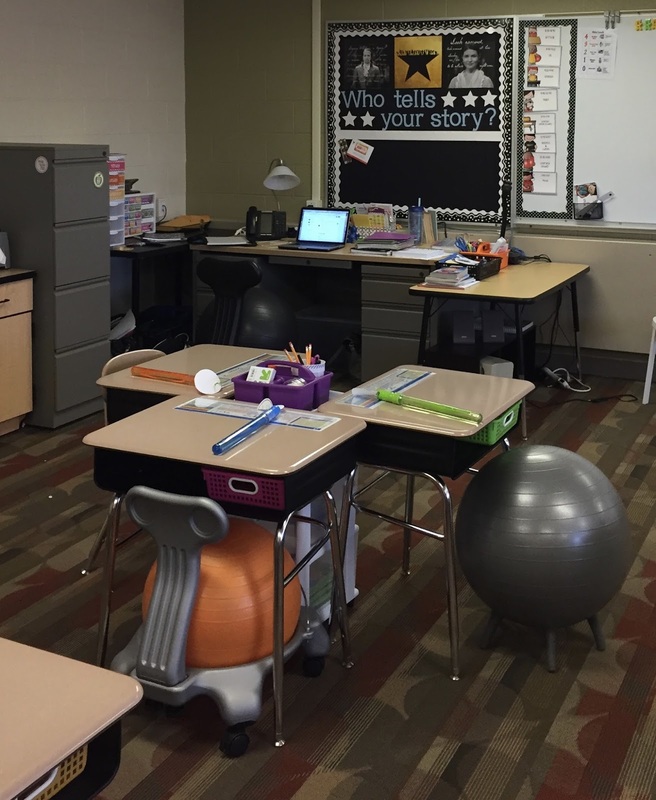 My thinking about my classroom space changed about eleven years ago when I had the opportunity to spend two days in classrooms in our elementary buildings. I noticed how different parts of the classroom were used for different kinds of activities. I noticed the anchor charts and student work on the wall. The classrooms felt warm and welcoming, like places where ideas were shared and encouraged. I decided I wanted my classroom to feel more like THOSE rooms and less like a traditional secondary classroom. So I set out to make changes. I got an easel that I could put chart paper on. I got a couch. I brought in some old area rugs I had at home. I moved the desks apart so that they were spread out around the room. I stopped hanging so many pre-made posters and saved wall space to reflect our learning. Yes, I pulled my seventh graders into our "living room" for our group instruction. We had class discussions here. Kids loved to read here during independent reading. It was a start. I could definitely feel a different vibe. But classroom environment is not all about furniture and rugs. It's also about the community that is created by the teacher AND the students. It's set when a teacher takes the time to get to know her students and incorporate their passions into the curriculum where possible. The environment is created when a teacher steps back and gives kids choices in where and how they will work and in the books they read. The environment develops when kids trust that their voices will be heard. Now I teach third grade. I spend a great deal of time thinking about the environment my students will encounter when they enter my classroom next week and that we will continue to create together. I want them to be able to tell what's important to me, and I want them to have some say about the changes we'll make as we begin to do the hard work of learning together. The desks are grouped into pods so kids can work together throughout the school day. Each pod has a little tote that has basic communal supplies and a three-drawer storage unit that holds math books, white boards and markers, and extra paper. Together, we'll figure out what, if anything, else should go in those drawers and that supply tote. The kids are the ones who will be using these, so they should have some say in how they access supplies and materials. My easel is on wheels, so I can move it to whatever area of the classroom I happen to be using at the time. Kids still gather in our large meeting space in the front of the room for most of our whole-group instruction, but during independent work time, they can sit anywhere. Last year, I had kids who really liked working under the small group tables. The kids can also choose their seating. I want them to be comfortable. If they like the chairs.. great! I also have wooden stools, wobble stools, yoga ball chairs (which I also use at my desk), and lap desks for sitting on the floor. They can move freely around the room and work wherever they feel most comfortable. In our first days together next week, we will set expectations for how to work in a flexible environment. The kids will be an active part of creating our learning community. As you can see, my walls don't have a lot on them. Some of my bulletin boards are done. That one above my desk is a hassle, so I put something up that will stay all year. 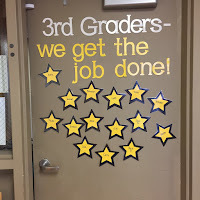 The others will feature kids' work, our "star of the week," and I have one board that the class will decide how to use. This is not just my work space... it belongs to my fifteen students as well, and they need to have ownership of how we work in it. I want my students to feel at home in room 301. I want them to know I honor their voices and stories, and that I want them to take risks and stretch themselves in order to grow as learners and people. I want them to learn how to work together and solve problems, and even get along with people who you might not like or who you might disagree with. I want them to think about big ideas and hard topics and begin to find their own truth. The environment is where this all starts.